I do not own a motor-car but I recommend them to all my friends and advise them to buy a car--so that they will come around and take me out in it. Somehow or other, riding over a rough road in a motor-wagon jolts certain parts of my torso that need to be jolted, but seldom ever do get jolted, same as when I run up stairs. It's splendid exercise and limbers up and promotes springiness--of the stair boards. Everyday throughout America, the Overspeeder runs over somebody and "escapes." That is the way it reads. At present the 'mobile numbers are so small that ordinary eyes cannot read them, upon a swiftly receding machine, at a distance of a hundred feet--a distance which the machine has covered before the spectator can adjust his focus. I think I would amend the law. I would enlarge the numbers, and make them readable at a hundred yards. For overspeeding--first offence--I would enlarge the figures again, and make them readable at three hundred yards--this in place of a fine, and as a warning to pedestrians to climb a tree. 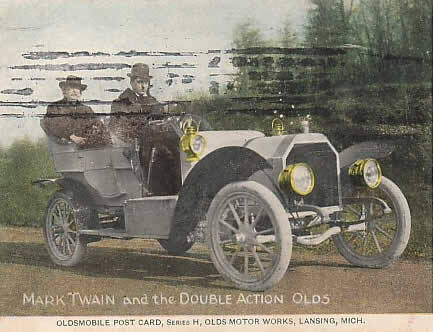 Used postcard of Mark Twain advertising Oldsmobile. According to an article in the Los Angeles Times, February 5, 1922, Mark Twain was given a ride in a 1906 Oldsmobile by famous race car driver Ernest Keeler. Keeler died in a racing accident on Nov 24, 1906 at Point Breeze Race Track near Philadelphia.